When the boys were in school and we spent a great part of the day in the car together, I took many pictures through the rear view or side view mirror. 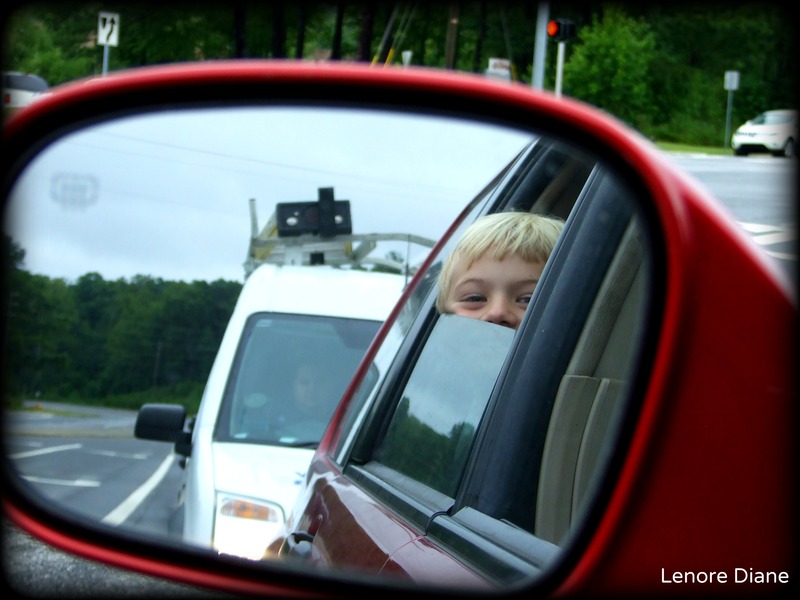 Recently, two Facebook friends of mine (well, they are real life friends, too) posted pictures of their kids, taken through a side view mirror. I should, eh? Thank you, Kim! This is great not only because it is bright of Charlie, but look at the guy in the car behind you! He’s (She’s?) checking out the action at the Stop Light! I think he is smiling for the picture, Carol. Funny! Another precious memory caught by the lens. It’s nice to capture a moment with the boys on a routine trip to school, Maxi. Those are some serious time-management skills, Ms. D!